I know that I talk a lot about deciphering needs from wants around here. But I’m not going to kid you. Sometimes a girl just needs some chocolate – like on a day when all three children are bouncing off the walls because it’s been pouring rain outside all day long and they’re bored after tearing apart the house. But a girl also needs to fit into her pants. Oh, Pillsbury Sweet Moments, thank you for letting me have it both ways! 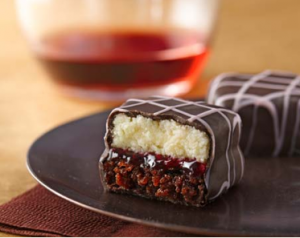 Pillsbury Sweet Moments are fabulously decadent cheesecake brownie bites. Just a little bite is enough sweetness to savor without being an insane amount of calories. Pillsbury Sweet Moments come in two new delicious flavors – Carmel Brownie Cheesecake and Raspberry Brownie Cheesecake, as well as Cocoa Fudge Escape, Cocoa Caramel Obsession, and Cocoa Fudge Chip. You can find Pillsbury Sweet Moments in your grocery store’s refrigerated section. They retail for about $3.19 for 12 brownie bites (you can grab a $1 off coupon). I found the Carmel Brownie Cheesecake in particular to be just the right size sweet treat on a day that just needed a little something! Want to try Pillsbury Sweet Moments for yourself? Two lucky readers will win a coupon for a FREE package of Pillsbury Sweet Moments! This giveaway is open to all US residents ages 18 and older and will end at 9 p.m. CST on Monday, September 5, 2011. Only one entry per person allowed. The information I collect in this giveaway will only be used to contact you if you are a winner and will never be given away or sold without your permission. I will randomly select two winners from all of the entries received. I will then notify the winners by e-mail and announce it here at Northern Cheapskate. The winners will have 48 hours to respond or I’ll draw a new winner. Disclosure: Pillsbury gave me Pillsbury Sweet Moments brownie bites to try and provided the prizes for this giveaway. Please read my full disclosure policy for more information. I just entered. Those brownies looked too delicious!